Iga Ueno (伊賀上野) is located in Mie Prefecture. Iga was home to Japan's most famous Iga Samurai and their techniques of ninjutsu. 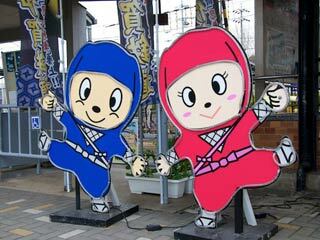 Iga's main tourist attractions are the Iga Ueno castle and the Iga ryũ ninja museum. There are many Ninja related shops, and you can find Ninja everywhere in this town. It is also the birth place of Matsuo Basho, the Haiku master. The main attraction is around the Igaueno Castle. Iga was developed as the post town between Kyoto-Nara and Ise Jingu shine. Therefore, there are many houses, cultures and other cultural buildings are strongly influenced by Kyoto art. For those looks of Kyoto, Iga is also called the little Kyoto. Iga city is also known as the birth place of Matsuo Basho (松尾芭蕉), the Hiku master. There is his house, and other Basho related spots are still remains. There is theory that Matsuo Basho was Ninja, the spy of Tokugawa government, to travel around Japan and research all the geological information of Japan. Writing Hiku, is his status to hide his real mission. If you believe he is just a great poet, then his mission is very successful even after 400 years. The Samurai of Iga were recognised from early on in Japanese history as experts in the skills of what later came to be termed ninjutsu. Their skills were recognised and used in battle by outsiders of the region from the earliest times and their exploits have fuelled the imaginations of generations and spurned a booming industry - the ninja industry.